People who visit different parts of the world and coat themselves with Teflon before they leave their home are missing out. I mean, if folks don't try different things and instead try to stay stuck in their familiar rut... well, why even bother leaving their living room Lazy-Boy? I just got back from Turkey (half the time in Istanbul and the other half in a small town called Gomec) and I could have had McDonald's, Domino's Pizza or Burger King while I was there. Istanbul has 'em all. However, I was determined to immerse myself as much as possible. As a writer, I try to do the same. I try to not wallow in a rut, and with some photos from my trip, hopefully I can make the connection between eating my way across Turkey and my experiences as a writer. Be willing to dive into the unknown. 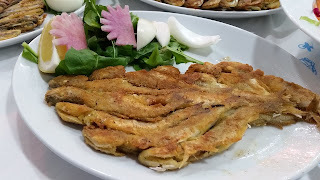 For dinner one night our friend Emel ordered three different kinds of fish for us to try. All Turkish. Two plates were covered with small fish, and everything but the tail was eaten. Bones. Eyeballs. Mrs. Paul's had nothin' on these fish. Was I thrilled? No, but I did eat them and I did keep an open mind. They really weren't as bad as I initially thought they'd be. A bunch of years ago I tried my hand at writing a romance short story for an anthology. The first time I dived into this unfamiliar genre, I got rejected. Too much snark and not enough sweetness. A second attempt was more successful. It got published despite it being not as good (in my opinion) as the first one. I learned some of the components of romance stories. Was I thrilled as I wrote it? No, but I did write and revise and I did submit... and I got published. Follow advice from those you trust. Last year I went to Turkey for the first time. Before I left, my teaching colleague told me, "If you get the chance, go to Aya Sofya." An old church? I figured if the opportunity came up, I'd go, but I wasn't chomping at the bit to see it. After all, I've seen lots of old churches in France. 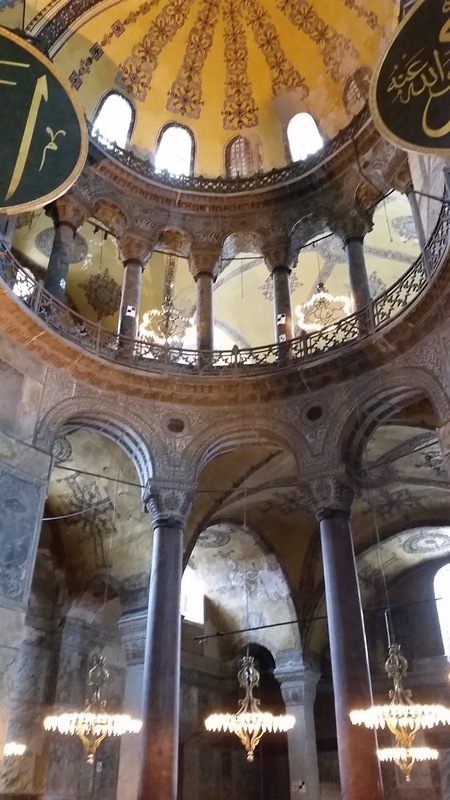 Aya Sofya is an incredible place. It was built in 400-something AD and is huge. It's such a jaw-dropping place, I went again on this trip. Thankfully, I listened to my teaching colleage and took their advice. As a writer, I depend on critique partners to help me during revising. Perhaps I'm too close to it, and in my delusional state, it's the next Pulitzer Prize winner. If my writing friends--gifted writers--think it needs major revising, I have to listen to them. Savor what you love. I fell in love with this dish on my trip last year to Turkey. 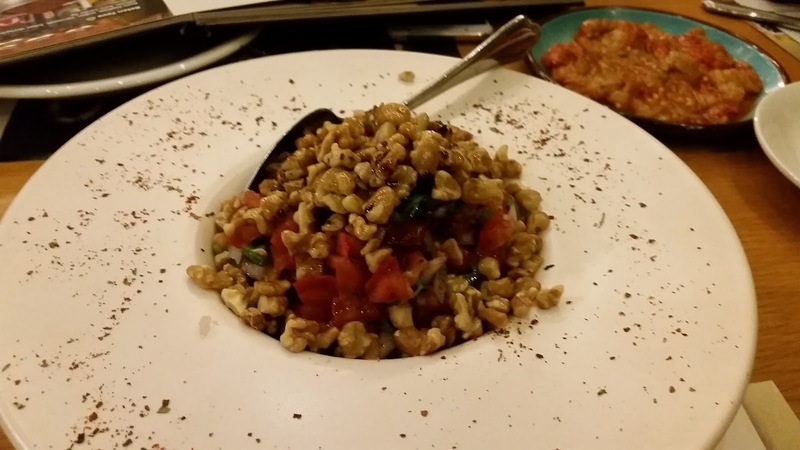 It consists of tomatoes, corn, onions, walnuts, some basil/parsley and a pomegranate glaze. When you have something once, and dream about it for a year, you know it's delicious. 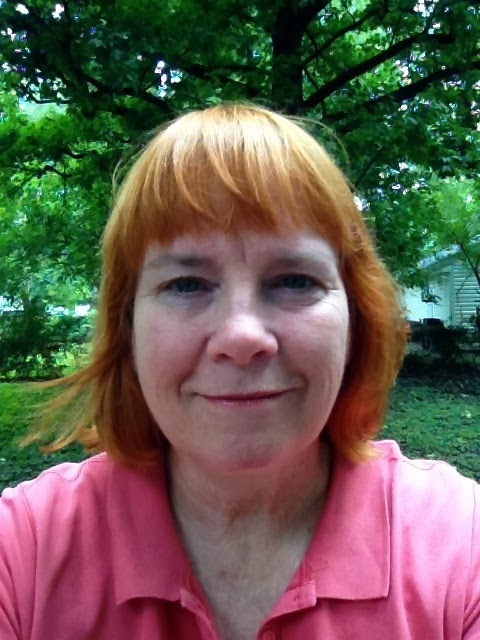 Maybe you love epistolary writing, like my friend Lynn. If so, write a book where the story is told through letters. Perhaps you love revising. Revel in the process. If you're one of those writers who loves to sketch, use that love of drawing to plot out your story/create a character.Take what you enjoy doing, and make it work for you. How about you? How has travel changed you? Or, how has travel impacted your writing? Sioux is a dog rescuer (that's why she went to Turkey, to bring back 4 golden retrievers so they could find forever homes), a middle school teacher (she only has a month or so left of school, and so much to accomplish), a wife and mom and grammy (being a grammy is so much fun) and a part-time writer. She belongs to an incredible writing critique group and a writing accountability group. If you'd like to read more of her writing. go to Sioux's blog. You are such a high achiever, great writer and devoted dog rescuer. World travel really is an eye opening experience. Those experiences can become rich details in future stories. Talking turkey, you did it well. Angela--Getting arrested and paying off federales? Getting stung by a scorpion? I'd love to hear those stories, and how you infuse humor into them. Linda--Thanks, but you have traveled so much more than me. I always enjoy hearing stories about your trips... despite the fact that Sasquatch is your travel partner. Margo--I'm jealous. That is a part of the world I've never been to. You made traveling sound fun... cause you know me Lazy Boy. However, I LOVE trying new foods and even in the US, I prefer to try local places versus the common fare. I really enjoyed how you tied this into writing. If you don't try, then you don't know what you might like or be good at. Nice piece. I too am now trying to figure out how I could create that walnut dish; I'll take a hard pass on the fish eyeballs :-) I love traveling but haven't been able to do as much of it as I like. I'm working on it, though! The kids and I put together a United States travel bucket list and the places we came up with suited our personalities: my daughter wants to see all the national parks, my son wants to go to any major cities with NBA/NFL teams, and the hubs and I just want somewhere with a white, sandy beach. Hope the dogs are settling into the U.S. well! The saying from some commercial years ago is still relevant: Try it. You might like it. Renee--If your kids haven't been to the Grand Canyon, I think you should put that at the top of your list. I went last summer, and it was an incredible trip. I'm with you---try new things! Even if one isn't traveling, try new things that are right down the block. The hubster and I moved from GA to FL in 2017, and in the last ten months have eaten out at chain restaurants only a couple of times. We've made it a point to hit the local joints, even the hole-in-the-wall places (actually, ESPECIALLY the hole-in-the-wall places). We've tried new things and found some real keepers. :) And your comparisons to writing are spot on. What an amazing experience and a luxurious church. I'm not big in traveling now, but in my you get years I traveled a lot and lived overseas.